JIPMER PG 2019: Jawaharlal Institute of Postgraduate Medical Education and Research, Conducts this Medical Entrance Exam for providing admission into PG Courses like Doctor of Medicine (MD) and Master of Surgery (MS) in a wide range of specializations. JIPMER PG Entrance exam is being conducted twice in a year in January and July Sessions. Latest Update: JIPMER PG 2019 Application Form for MD/MS and MDA courses July session can be filled till 1st April 2019 Check the Date and Procedure Below. Offered Courses: PG i.e. Doctor of Medicine (MD) and Master of Surgery (MS) in a wide range of specializations. Exam Centers: Ahmedabad, Chennai, Trivandrum, Kolkata, Mumbai, Bangalore, New Delhi, Puducherry, Bhuvaneswar, and Vijayawada. JIPMER PG 2019 January Session Dates Announced already. You can check the schedule of January session in the given below. The JIPMER PG 2019 Exam Dates can be checked Here. To Appear in the JIPMER PG Entrance exam there are some Eligibility Criteria and interested candidates need to fulfill all of them. We are listing here the JIPMER PG Eligibility Criteria for MD/MS courses. Make sure to check your Eligibility. Indian candidates, Overseas Citizens of India, and Non-Resident Indians can Apply Online for JIPMER PG. All candidates who want to appear in JIPMER PG Entrance Exam must hold an MBBS or equivalent Degree. They also Need to complete their 12 months compulsory rotating internship or Practical training on or before the last week of December 2018. Candidates should have obtained a minimum of 55% marks in aggregate, there is also 5% relaxation for SC/ST candidates. Candidates who have already completed MD or MS course in any subject in any medical college are not eligible for JIPMER PG Admission and even not in the entrance exam. The Age Limit is not announced yet. The JIPMER PG Application Form will be available through Online Mode only. Candidates have to follow the procedure given below to fill the JIPMER PG Registration Form without any mistakes. Just keep in mind that After the final submission of Application form, candidates will be not allowed to do or request any changes in their application form. Candidates have to Visit the Official site through the link given below. Then Register yourself using email and phone number. Now after registration Login on the site and move to the application form. Fill all the Personal, Educational, and Correspondence address and connecting details. Check your filled details, and upload scanned image (details given above). Check the filled form and make the correction is required before submitting the form. Now move to the payment page and pay the fees and print the receipt of payment and filled application form now click on submit. That’s it You have successfully submitted the JIPMER PG 2019 Application Form. JIPMER PG will be conducted in Online Computer-based Mode. We are here providing JIPMER PG 2019 Exam Pattern. Candidate can observe the basic details of the exam and paper. One Mark will be deducted for the wrong answer. JIPMER PG Syllabus will be available on the official website it will comprise of various topics from the relevant courses chosen by the candidates. Visit the official website and get syllabus according to your preferred course. Arrange study material according to the courses/syllabus. Always manage the time during the Preparation and exams. Observe Exam Pattern and solve previous years JIPMER Question Paper. Practice on computer-based tests to increase the speed and accuracy. JIPMER PG Hall Ticket will be also available on the official website. Candidates have to log in to the official website to access and download the admit card. Admit card is a very important document for the exam you have to keep it safe till the admission. Candidates also need to bring the JIPMER Admit Card 2019 to the examination center with an id proof. 2 or 3 weeks After Exam the JIPMER 2019 PG Result will be announced on the official website. Candidate can check the result on the official website after logging in to the official website. The exam authority will also prepare and release a merit list containing the names of the qualified candidate. On the basis of the same JIPMER PG Merit List candidates will be called for the counseling. Counseling for JIPMER Admission will start in next few weeks after the exam. Qualified candidates will be called for the counseling on the basis of their rank in the merit list. The JIPMER 2019 PG Counseling will have many steps and rounds in every round candidate have to go through these process. The number of Counselling Rounds will depend upon vacant seats. After Counselling and JIPMER 2019 PG Seat Allotment candidates have to report to the alloted college for the admission procedure. JIPMER is a medical institution founded and established in 1823 by the French Government. It is a well-reputed institute which offers UG, PG, doctoral, super specialty & other courses in the field of medical. 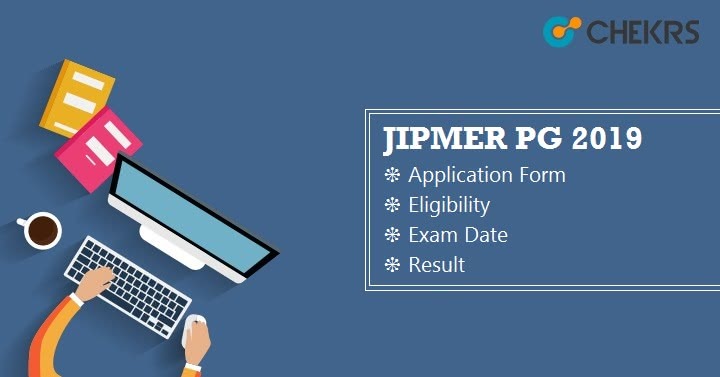 In this article, we will talk about JIPMER PG, JIPMER PG Application Form, Eligibility, Exam Date and how you can easily apply online for JIPMER PG Entrance Exam.